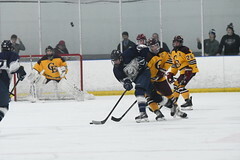 Yarmouth and Scarborough skated to a 2-2 tie on Saturday night at USM Arena. Michael Guertler ’19 scored both goals and Charles Henry Watson ’22 turned away 32 of 34 shots. The Clippers will have a week off until they host Gardiner this Saturday in an important divisional match-up. Game time is 7:40 pm. The opening period was not good for Yarmouth as they struggled to break the puck out of their zone and often settled for just chipping the puck into the neutral zone in desperation. Again, Charles Henry Watson came up big and kept the Clippers in the game. 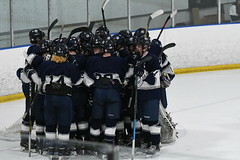 Because of Watson’s outstanding play, Yarmouth only trailed 1-0 at the end of the first period. The Clippers played better in the second period, but struggled to move the puck effectively in the additional space provided by the Olympic-sized ice surface. Far too often, Yarmouth was content with taking perimeter shots that sailed over the net or were easily gloved by the Scarborough netminder. Justin Veilleux ’20 introduces himself to the Scarborough goaltender in the second period. The Red Storm took exception. Late in the second period, Yarmouth finally started winning battles down low and the result was a power play goal from Michael Guertler. Kurt Heywood passed the puck to Guertler at the point who fired a shot into traffic. The result was a deflection off a Scarborough defender to tie the game. Spencer King ’20 picked up the secondary assist. 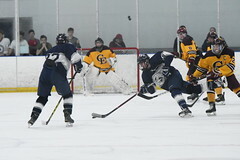 In the third period, the Clippers finally began to pull their game together and with 6:11 left in the game, Matt Sanborn ’19 made a nice pass to Michael Guertler on a 2 v 1 and Guertler buried his shot on a picture-perfect scoring play. Aidan Miller ’20 was credited with the secondary assist. Suddenly, the Clippers had the lead. However, less than three minutes later, Scarborough took advantage of a scramble in front of Watson and evened the score. The Clippers started sudden-death overtime with a 4:00 double-minor penalty, but successfully killed it off. A power play at the end of overtime gave Yarmouth an opportunity to pull out victory, but they were unable to find the game-winner.